Monstro is a polyphonic 3-oscillator realtime softsynth included in version 1.1.3 of the Linux Multi-Media Studio (LMMS) suite. If you have an older release, the newer version can be found in the KXStudio repositories, or directly from source code (see the LMMS website below for more details). After opening LMMS, click the "Instrument plugins" tab (the first little box on the left side of the screen, below the Project menu selector) and drag the "Monstro" icon into the Song Editor section to open it. 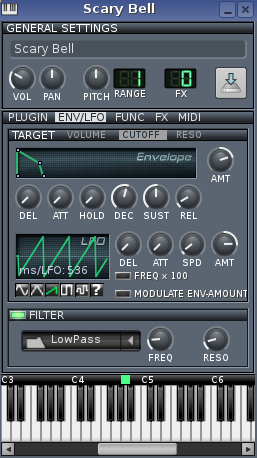 Monstro includes a variety of modulation techniques and control possibilities. 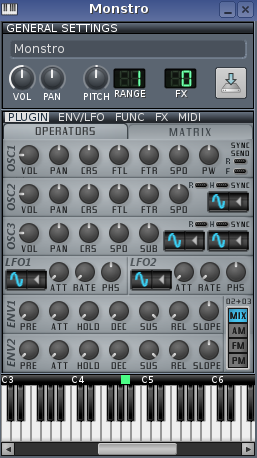 In addition to the macro controls for ADSR amplitude, frequency and resonance, a variety of filters to choose from, arpeggiation, chording and effects chaining that are available with all instruments in LMMS, Monstro offers three oscillators, which are controlled on two main pages: "Operators" and "Matrix." All three oscillators have volume, pan and coarse detuning (plus-minus 2 octaves). Oscillator 1 is a square wave. Oscillator 2 has a variety of waveforms to choose from. 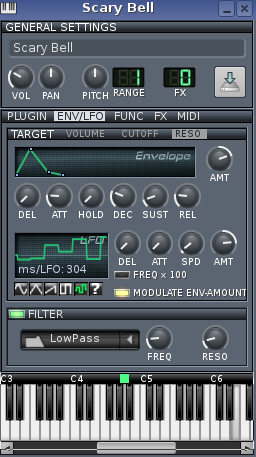 Oscillator 3 has dual waveforms and a sub-oscillator. All oscillators have sync capability. Oscillators 1 and 2 can be fine-detuned separately for right and left outputs, and stereo phasing is also provided. Oscillator 1 has pulsewidth control. Oscillator 2 can modulate Oscillator 3 in four different ways: as general mix, Amplitude Modulation, Frequency Modulation and Phase Modulation. Click on the desired modulation button in the lower righthand area of the "Operators" page. There are two LFOs and two envelopes, all of these assignable to the oscillators on the Matrix page. 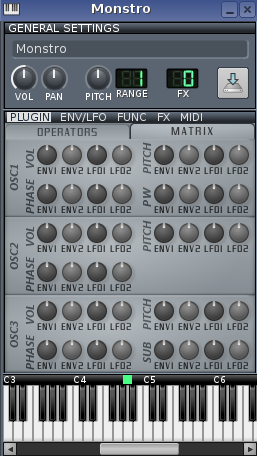 The "Matrix" page allows oscillator routing to Envelope 1, Envelope 2, LFO 1 and LFO 2. Each oscillator's pitch, phase and volume can be routed. In addition, oscillator 1's pulsewidth control is routable, as is Oscillator 3's sub-oscillator.